Growing up in a community in northern New York State, where the high-tech industry was a significant feature of the area economy, I was surrounded by engaged and effective math and science teachers who made the subject matter come to life for me. Today at Texas Instruments (TI), I work with many people who share a similar passion for science, technology, engineering and math education (STEM) and know firsthand how its application can change the world. Improving STEM education is an issue that’s critical to the future of our communities, state and nation, and it needs the personal involvement of business and community leaders. It demands our attention and involvement as employers and citizens. Recently, Dallas Mayor Mike Rawlings and about 40 Dallas CEOs and “C-level” executives joined with TI and United Way of Metropolitan Dallas for an innovative “STEM in the Schoolyard” project. We worked side-by-side with fifth-graders at the Dallas Independent School District’s Gabe P. Allen Charter School, conducting interactive experiments to enrich the students’ knowledge and explore key STEM principles. Students from Gabe P. Allen Charter School in Dallas with TI CEO Rich Templeton. The quality of our education infrastructure – particularly science and math education – will be a critical factor in defining the future economic success of our region, state and nation. As the world becomes more technologically demanding, a solid foundation in these disciplines is more important than ever. These are the skills that employees of 21st century companies must have to innovate and be successful. STEM touches many career fields. STEM jobs are growing three times faster than non-STEM jobs, and STEM workers earn 26 percent more than their non-STEM counterparts. Even jobs in trade professions such as auto mechanics or welding require competency today in algebra, geometry and electronics. Workforce projections for 2014 show that 15 of the 20 fastest-growing jobs will require math or science training, and that by 2018 there will be 1.2 million job openings in STEM-related fields, but a shortage of people to fill them. Our biggest challenge: Fewer students are studying and graduating in these areas. U.S. businesses are deeply rooted in innovation, and, if we want to continue to be leaders in technology and research and keep generating job growth, then we need an intense and collective focus on STEM education to succeed. First, federal and state governments and independent school districts (ISDs) need to prioritize policies that promote improved performance in math and science coursework for all demographics. This includes high standards and measured accountability to assure student achievement and highly effective instruction. 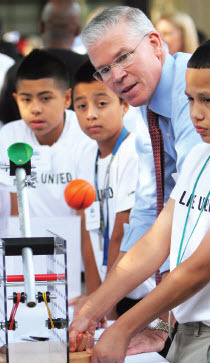 And second, as the principle funder and customer of the public education system, the business community has a very important role to expand proven STEM initiatives through advocacy, investments, volunteerism and collaboration with government, schools, nonprofit organizations and other corporate stakeholders. At TI and the TI Foundation, these types of partnerships have enabled us to impact STEM awareness, teaching effectiveness and student achievement in the following ways. The TI Foundation supports the Advanced Placement™ (AP) Incentive Program, which is now offered in all Dallas ISD high schools and in Mesquite ISD, and is being scaled nationwide by the National Math & Science Initiative (NMSI). Since the TI Foundation’s partnership with Dallas schools began in 2000, more than 18,500 North Texas students have passed AP exams for college credit. Many other corporations and foundations recognize the impact of this initiative and also support it with time and resources. TI also developed the MathForward program in conjunction with Richardson ISD in 2005 where technology, teacher training and funding has significantly narrowed the achievement gap for Hispanic, African American and economically disadvantaged students in middle school math. The program has grown to 18 states, 76 districts and more than 300 schools. TI and the TI Foundation partner with UTeach, a University of Texas-founded program to recruit, prepare and retain more qualified STEM teachers. Since 2009, the TI Foundation has funded programs at three North Texas universities. As a result, the number of future educators in science and math education has increased significantly. In fact, these programs are expected to produce about 800 math and science teachers by 2018. During the course of their careers, those teachers will serve nearly a quarter of a million students. The TI Foundation also is working with a local school district to pilot a district-wide implementation of a more impactful STEM instruction protocol. Going forward, it will donate up to $4.8 million to help Lancaster ISD partner with Educate Texas, a public-private initiative designed by Communities Foundation of Texas. The intent of this collaboration is to create a STEM education model that other districts will replicate across Texas. Eleven years ago 30 women employees from TI made personal contributions to establish a donor-advised fund at the Dallas Women’s Foundation because they were concerned about the low number of women graduating with technology-related degrees. With additional support from other employees and the TI Foundation, “High-Tech High Heels” has become an effective strategy to close the gender gap in the STEM fields and helped thousands of educators and students; it exists because these TI women cared and got personally involved. In addition, this year TI helped launch the first-ever STEM engineering patch with the Girl Scouts in Northeast Texas. Available to 35,000 girls in kindergarten through 12th grade, this curriculum will make learning more about STEM fun, and we’ve encouraged local female engineers to get involved and serve as role models. Texas is a great state in which to do business, but we need to ensure that our workforce can support the growth and innovation to keep our economy moving forward. Government, education, business and community leaders need to make STEM proficiency a statewide and national imperative. We can help by investing in proven programs that work and get measurable results, and by getting personally involved. The rewards are great. We can make a difference. The Leader's Leader How Full Is Your Bucket?